Pvt. 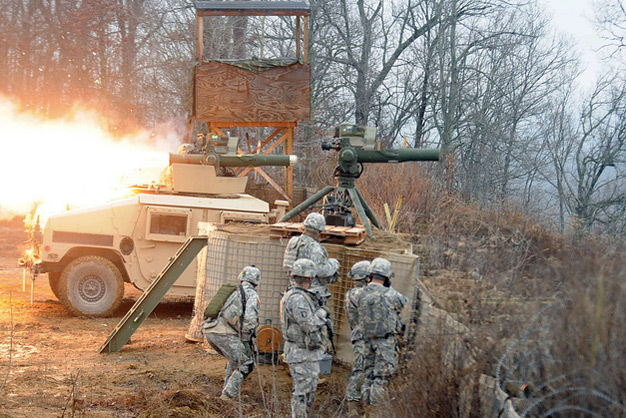 1st Class Collin R. Hoffmeyer, a gunner with Troop A, 1st Squadron, 32nd Cavalry, 1st Brigade Combat Team, 101st Airborne Division, fires a Tube-Launched, Optically-Tracked, Wire Command Data Link Missile from the turret of a Humvee on December 6, 2011 at Observation Point-12 in Fort Knox, Ky. The squadron was training here in order to complete their gunnery tables. Photo by the US Army.